Watsons is a must-go whenever I go to a place with one, cos it has all the super cool cosmetics all the way from America to Japan. 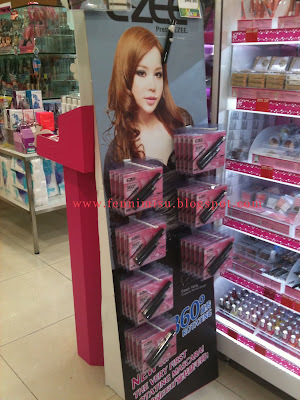 Went to Vivo pretty recently and saw a new product in store - a rotating mascara! The brand's called EZEE, which is something I didn't hear of before... Anw. There was a sample so I went to see if it really rotates and not vibrate like the Maybelline one HAHA. Yes, it really rotates and there's even a left or right direction for its rotation, which is very helpful for doing both left and right eyelashes. The standee, with a sample and flyers. The very FIRST rotating mascara! Since this brand's kinda unheard of to me, I had to google it. This brand is supplied by http://www.teeni.com.sg/ in SG, which also supplies Canmake products. EZEE is also an existing brand focusing on makeup tools and stuff like that. Only available in Glossy black, mehhhh. A good beauty product review! Keep it going Fenny! Cheers from WardrobeTrendsFashion.com(WTF) - Singapore Fashion & Lifestyle Magazine!